Neonatal tetanus (NNT) is tetanus affecting neonates, that is babies within the first 28 days of life. NNT is an important cause of avoidable morbidity and mortality ,,,,,,. In the past, this disease was overlooked by the health services of many developing countries, but recently, the extent and magnitude of NNT were found to be a very serious health problem in developing countries . Unlike smallpox and polio, complete eradication of tetanus is not possible because the spores can survive for a longtime outside the human body in the dirt and in the stool of infected people and animals, so the disease can be transmitted without any human contact . NNT can only be eliminated with the goals adopted by the World Health Assembly in 1989 and by the World Summit for Children in 1990 ,. NNT is considered eliminated from a country when the annual incidence is <1/1000 live births . The elimination of NNT is an essential and attainable goal through a combination of two approaches, increasing the immunization coverage of women of child-bearing age, especially pregnant women, and improving maternity care, with particular emphasis on increasing the proportions of deliveries that are attended by skilled personnel ,. NNT mortality should serve as an index of the quality and the extent of utilization of maternal health services, of the impact of immunization programs, and of the progress being made in achieving the elimination of NNT ,. The NNT elimination framework involves strengthening routine tetanus toxoid immunization of all pregnant women with immunization of women during their child-bearing years, especially those living in high-risk areas, hygienic delivery of newborns, and improved NNT surveillance. This strategy has led to a 93% of reduction in NNT cases worldwide but 25 countries including Nigeria continue to record an unacceptably high prevalence of NNT ,. The World Health Organization recommends that reproductive-aged women should commence a 5-dose regimen of tetanus toxoid vaccination as early as possible. This comprises a first dose given at any time from the age of 15 years, a second dose 4 weeks later, and a third dose 6–12 months after the first two doses. The fourth and fifth doses are given 1 year apart and further strengthen the immune system against tetanus for about 20 years . The program for anti-tetanus vaccination remains facility-based with most communities not targeted. In Nigeria, only a few students have accessed this life-saving vaccine while undergoing treatment for injury . Only an estimated 47% of Nigerian infants have received the third dose of the diphtheria-pertussis-tetanus vaccine and about 60% of women of child-bearing age have a protective level of immunity against tetanus . This resultant high burden of tetanus in Nigeria suggests the need to improve tetanus toxoid vaccination in all at-risk groups including women of child-bearing age . This slow pace of tetanus toxoid vaccination uptake means NNT elimination is unrealistic in the near future. Therefore, the objective of this study was to assess the knowledge about and preventive practices against NNT in women of reproductive age. The present study was conducted at a private tertiary institution, The Polytechnic, Ile-Ife, Osun State, Nigeria. The institution offers certificate, National Diploma and Higher National Diploma courses in accounting and business-related disciplines and has a student population of over 8300. A descriptive cross-sectional study design was used with women of child-bearing age attending the polytechnic as the study population. The sample size was determined using an appropriate statistical formula in descriptive health studies (n = Z2pq/d2)  where 68% women of child-bearing age reported receiving two or more doses of tetanus toxoid vaccine . A sample size of 380 was used with nonresponders taken into consideration. The number of respondents recruited into the study was determined based on the proportion of women of reproductive age in the disciplines. They completed a pretested semi-structured interviewer-administered questionnaire designed to elicit knowledge of tetanus, perceived risk factors for NNT, and awareness and uptake of the tetanus toxoid vaccine. The level of uptake of tetanus toxoid vaccine is considered complete when the expected five doses have been received by the respondent as scheduled. Questions on knowledge of tetanus included having heard of tetanus before the interview, having heard about or seen a case of tetanus, clinical features, causes of tetanus, mode of transmission, prevention, and personal risk assessment. Questions on knowledge of risk factors of NNT included having heard of NNT, importance of antenatal care in tetanus prevention, tetanus immunization, and predisposing factors such as choice of place of birth, unskilled birth delivery, and poor umbilical cord care. Pretesting was carried out among women of child-bearing age at Obafemi Awolowo University, Ile-Ife. Data collected were analyzed with SPSS software version 11.0 (SPSS Inc., Chicago, IL, USA). Simple descriptive and inferential statistics were used with findings presented in the form of frequency tables. Knowledge scores were computed from questions on knowledge of tetanus. Each item was assigned (+1) for an appropriate response and (0) for an inappropriate response. These were classified into good and poor knowledge of tetanus, using the mean score as the cutoff point. Association was determined using the Chi-square statistical test and significance was accepted at P < 0.05. Ethical clearance was obtained from the Polytechnic Ethics and Research Committee while permission was received from the institution's Directorate of Students' Affairs. Informed consents were obtained from the respondents. Data collected were kept in a password-protected computer. A total of 380 women of reproductive age participated in this study. The mean age (standard deviation [SD]) of the women was 22.4 (4.6) years ranging from 15 to 30 years. [Table 1] shows that slightly above half (52.9%) of them were between 21 and 25 years, with a higher percentage (50.8%) studying accounting-related courses. Nearly all (96.3%) were single, and most (87.1%) were Christians, whereas the majority (88.4%) were from the Yoruba ethnic group. The mean knowledge score (SD) was 14.8 (7.6) with a score >14.8 taken as good knowledge and a score ≤14.8 taken as poor knowledge. Only 35.5% of the respondents had a good knowledge of tetanus. About 31% were aware of tetanus immunization and the main source of information was health workers (51.3%). Most of the women (58%) were unwilling to receive tetanus immunization. 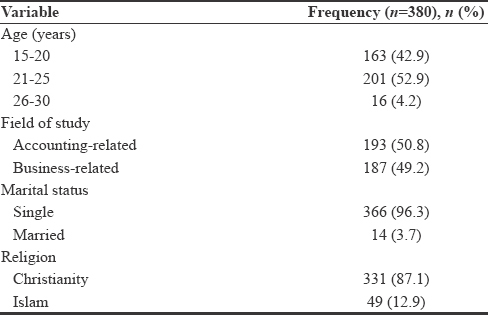 In addition, 15.5% had had at least one dose of tetanus toxoid with only two (3.4%) respondents having had complete tetanus immunization [Table 2]. There was no statistically significant association between socioeconomic status and willingness to receive tetanus toxoid immunization (P > 0.05). A higher proportion of respondents with good knowledge about tetanus had tetanus toxoid immunization (28.1% vs. 8.6%; P < 0.0001) [Table 3]. The findings in our study showed that most of the young women lacked appropriate knowledge of NNT, with some willing to get immunized while only a few respondents were already immunized. This situation is not acceptable if this dangerous killer among neonates should be eliminated. The poor awareness of the tetanus toxoid vaccine is also not acceptable. This finding is higher than that in a previous study by Ayub et al. who reported that 16.5% of young women in Karachi were aware of this immunization . Our study reported health workers were the major source of information for tetanus immunization which is in contrast to the study done by Tanjida et al. who reported the media as the major source of information . Some of our respondents also received their information from the media. This finding was also reported in other studies ,,,. This implies the need to ensure accurate information is given by the media to the general public, as well as women of child bearing-age, on tetanus immunization. This enlightenment campaign should link getting immunized against tetanus with the elimination of NNT ,,,. Although, this study did not report a statistically significant relationship between socioeconomic status and willingness to receive tetanus toxoid immunization, empowering women economically while providing community-based education about tetanus immunization and linking it to NNT prevention could increase uptake of the vaccine. Furthermore, tetanus toxoid vaccine should be made available at an affordable cost where these women can readily access it with adequate follow-up to ensure completion of the vaccine as scheduled. This will boost the proportion of young women immunized against tetanus which will help to eliminate NNT. Although, the Nigerian Government embraces the current international political strategy targeting NNT elimination, which specifies that all women of reproductive age should complete tetanus toxoid immunization, more needs to be done to achieve this goal. For instance, health workers need to be educated and encouraged to reduce the vaccine wastage and ensure the vaccine gets to the recipients in good condition. This study provided information on knowledge about tetanus, and awareness and uptake of tetanus toxoid immunization among young women. However, it is limited by its cross-sectional design with information self-reported, and hence, subject to information bias such as recall bias. Recall bias was reduced through asking questions to double check the responses. Since this study was conducted in only one educational institution, its findings might not be readily generalizable to other institutions or communities. Nevertheless, information provided by this study will be very useful in policymaking and implementation of interventions targeting control and prevention of NNT in the study area. Most young women lacked appropriate knowledge of NNT with some willing to get immunized with tetanus toxoid, whereas only a few respondents were already immunized. Periodic regular immunization campaigns should be done in tertiary institutions, incorporating talks, and teaching concerning NNT into their health services. Tetanus toxoid immunization should be integrated into already existing youth-friendly and school-based reproductive health activities such as condom vending services and peer education activities. Easy accessibility to health facilities for NNT vaccination services is needed for female students in our tertiary institutions' health centers. Training courses for health workers and midwives are needed to ensure clean and safe-delivery practices for students who get pregnant while in school. Community-based education including neighbor-to-neighbor sensitization will ensure adherence to the guidelines targeted at eliminating tetanus infection in young women and neonates. Ali M, Mazhar AU, Haq MI. Tetanus neonatorun. Pak Peadiatr J 2002;26:187-90. Stanfield JP, Galazka A. Neonatal tetanus in the world today. Bull World Health Organ 1984;62:647-69. Khan R, Vandelaer J, Yakubu A, Raza AA, Zulu F. Maternal and neonatal tetanus elimination: from protecting women and newborns to protecting all. Int J Womens Health 2015;7:171-80. Thwaites CL, Farrar JJ. Preventing and treating tetanus. BMJ 2003;326:117-8.
WHO. Tetanus vaccine. Wkly Epidemiol Rec 2006;81:197-208. Talati N, Salahuddin N. Factors affecting tetanus mortality in a tertiary care hospital in Pakistan. Infect Dis J Pak 2000;10:13-5. Nte AR, Ekanem EE, Gbaraba PV, Oruamabo RS. Social-environmental influences on the occurrence of neonatal tetanus in some riverine communities in Nigeria. Trop Doct 1997;27:234-5. United Nations Economic Commission for Africa. Report on Progress in Achieving the Millennium Development Goals in Africa. Addis Ababa, Ethiopia: United Nations Economic Commission for Africa; 2013. Saleh JA, Nemecek J, Jones C. Neonatal tetanus and gender disparity. EJPM 2015;3:71-4. Orimadegun AE, Adepoju AA, Akinyinka OO. Prevalence and socio-demographic factors associated with non-protective immunity against tetanus among high school adolescents girls in Nigeria. Ital J Pediatr 2014;40:29. Fetuga M, Ogunlesi T, Adekanmbi A, Runsewe-Abiodun T, Ogunfowora O. Neonatal tetanus in Sagamu, Nigeria during the Expanded Programme on Immunization and the National Programme on immunization eras: A comparative analysis. Internet J Pediatr Neonatol 2010;12:1-5. Kish L. Survey sampling. New York: John Willey & Sons; 1965. Singh A, Pallikadavath S, Ogollah R, Stones W. Maternal tetanus toxoid vaccination and neonatal mortality in rural North India. PLoS One 2012;7:e48891. Ayub J, Qadir M, Murad R, Seema Mumtaz S, Azmi A, Rehman R, et al. Awareness and uptake of tetanus immunization among female students of Karachi University. Infect Dis J Pak 20l0;22:1-4. Tanjida S, ArifulHuq SM, Sudhira B, Nahid S. Status of knowledge and practice about complete tetanus toxoid immunization of unmarried female students of a public university in Dharka. Bangladesh J Med Sci 2009;8:1-7. Zeb A, Zaidi SA, Jehan I. Knowledge, attitude and practices of reproductive age females about tetanus toxoid vaccine: A pilot study. J Coil Physicians Surg Pak 2006;16:791-3.